After a thorough evaluation, Dr. Young can tell you whether you’re a candidate for dental implants. Good bone density and oral health are prerequisites. The first stage of the procedure involves minimally invasive oral surgery in which a titanium post is implanted into the jawbone for each missing tooth or for the new teeth that will anchor a bridge or denture. Your bone tissue fuses around the titanium post, and creates virtually painless surgery resulting in a solid foundation for replacement teeth. Once the implants are secure and your gum tissue has healed, you’ll return to our office for the restoration. Our lab fabricates a handcrafted, permanent crown(s) or implant-retained prosthetic, according to the dentist’s design. Your new teeth will match the color and size of your natural teeth, so they’ll blend seamlessly with your smile. Dr. Young will secure the restoration right in our office. By imitating an entire natural tooth, from the root up, dental implants offer prosthetic replacement teeth that closely mimic nature. The result? Dental implant patients enjoy restored dental function while eating and speaking. Strong and secure, your new implant supported smile will boost your confidence, enhance your appearance, and improve your quality of life. 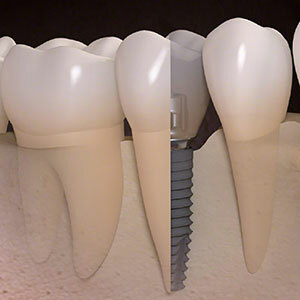 When it comes to dental implant systems, it really does matter who makes the implants. Dr. Young prefers Straumann dental implants for their exceptional quality and precision. One of the most innovative leaders in implant technology, Straumann implants have been used in more than 14 million cases worldwide. These implants are backed by science -- and their continual research and achievements have allowed for great strides to be made in implant surface technology, high-performance implant materials, and oral regeneration. Straumann implants come from a background of advanced Swiss engineering and offer solutions for the needs of all patients. Straumann introduced the SLActive® implant surface, which promotes faster osseointegration and higher predictability in implant cases. Their patented Roxolid® implant surface offers greater strength and osseointegration than pure titanium implants allow. The Straumann name is associated with exceptional reliability, integrity, and products that have been rigorously tested in preclinical and clinical trials. We are pleased to offer a higher standard of care with Straumann dental implants!